If you like to wear exciting looking dress shirts and tie sets with your suits have that bold look and attitude, You should be familiar with Daniel Ellissa. Daniel Ellissa specializes in making the latest style fashion dress shirts for men who love wearing anything that isn't ordinary. 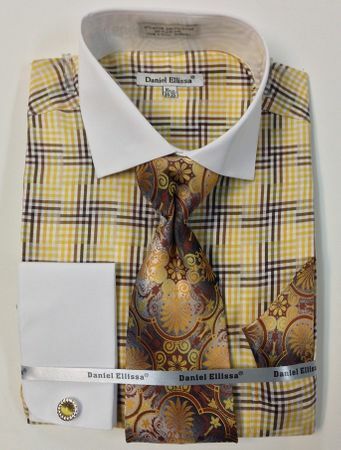 This mustard color cross plaid dress shirt features french cuffs and a contrasting white collar and comes with the matching tie and hanky set. Made of cotton/poly fabric.